Whether you’re in the market for a diamond wheel or another type of Superabrasive, Eagle Superabrasives boast an extensive inventory of over 6,000 diamond, CDX and CBN Borazon wheels that will match your needs. Eagle Superabrasives is a leading source of supplies in the United States. Ninety-percent of orders are on location at our Hickory, NC, headquarters and are ready for same-day shipping. We can even fill custom orders in as little as seven days. Don’t settle for subpar Superabrasives; contact the experts at Eagle Superabrasives for all your grinding need. 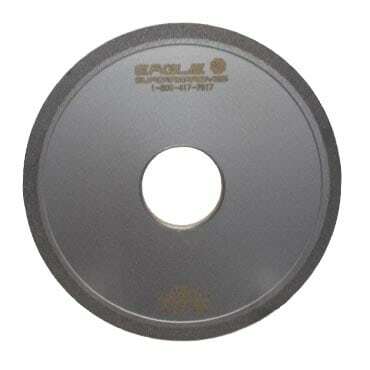 At Eagle Superabrasives our Polycrystalline diamond (PCD) wheels consist of a vitrified bond. As a result, a chemical and mechanical binding of the diamond abrasive to the bond structure occurs. An enhanced bond on our diamond wheel minimizes diamond pull out, extending the life of the wheel. Extending the life of our products is of great concern to us, so when it comes to choosing the right diamond wheel for your need, it is important to consider a few things. Along with the importance of a strong bond in a diamond wheel, diamond concentration is of great importance when considering the life expectancy of a wheel. The diamond concentration in a diamond wheel impacts the wheels life, along with the cycle times of difficult to grind (DTG) materials. Research has shown that there is an inversely proportional relationship of diamond concentration and cycle time. Cycle time increases as diamond concentration increases. The load principle on the wheel explains this correlation of diamond concentration. As the concentration of diamond is reduced on the wheel, each diamond on the wheel has a greater load applied to it. This greater load makes the diamond wheel breakdown more rapidly when removing material. On the other hand, higher concentration diamond wheels have a prolonged life due to the diamonds being closer together and the load per diamond is reduced due to the increased concentration of diamond over all in the wheel. As the diamond concentration increases the workload decreases extending the diamond wheel life. However, a higher concentration of diamond can reduce the overall cutting efficiency of the wheel. Cycle time is much lower for low concentration diamond wheels. No matter what kind of diamond wheel you’re in the market for, the experts at Eagle Superabrasives can manufacture one to meet your industries specific needs. Our experienced staff will provide support and advice along the way. With unmatched customer service, superior products and fast shipping, Eagle Superabrasives is an easy choice for all your grinding needs. Contact us today to place an order!